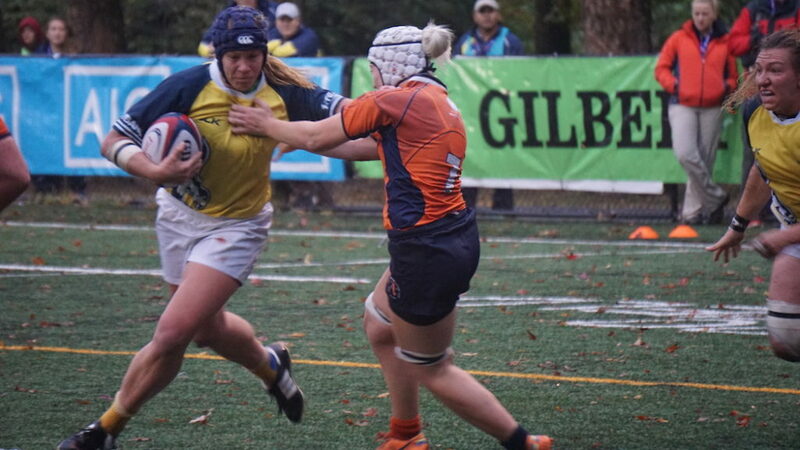 The 10th Women’s Premier League (WPL) title is down to Glendale and San Diego, both of which won their semifinals inside Life University’s Lupo Field in Marietta, Ga. All five placing matches will occur on Sunday, Oct. 28, and live-stream via FloRugby. The first semifinal pit reigning champion New York, and Blue Conference winner San Diego against each other. The last time these two sides met, New York took a 38-32 semifinal win to the title match. But as San Diego captain Liz Trujillo explained, there was no reminiscing about 2017, just laser focus on playing one half at a time. The Surfers went to work and built a 18-0 first-half lead off Megan Foster’s boot (two penalties and a conversion) and tries from wing Kimdinh Tran and flanker Sam Pankey, who along with Kate Zackary, did a great job breaking off of defensive scrums. Both teams deployed good kicking games and took advantage of the opportunities that wet weather can sometimes provide. A great battle between San Diego’s Tia Blythe and Teigan MacDonald, and New York’s Sarah Levy and Shamira Robles evolved. Levy put her side on the board after a long campaign at the line, scoring her 18th try of the fall. But San Diego answered right back, with nice flat passes, and thumping hard hits from Laura Easterling to put flanker Talia Carrasquillo away, 23-5 with 30 minutes to go. With 10 minutes to go, the game looked like it was San Diego’s, but New York was able to camp out in the Surfers’ end. Robles and then Kristen Siano, who also added a conversion, crossed for tries, and with minutes to go, the teams were only a converted try apart, 23-17. San Diego, which was playing the final eight minutes down a player, marched down the field and Foster kicked a third penalty to seal the 26-17 win. Glendale won the other semifinal, 30-5, over Twin Cities but the game was hardly lopsided. The Amazons took over for the rain and made the Merlins’ possession messy, especially in the breakdowns. Glendale is a physical team, too, and captain Sarah Chobot scored the opening and final tries of the half, one of which Hannah Stolba converted. In between, Twin Cities flyhalf Katana Howard set up a beauty of a try, as the Amazons attacked inside Glendale’s 22. Howard peeled away from a scrum, chipped over an on-rushing defense and gathered the ball for the fall-over try. Twin Cities only trailed 12-5 at the half, but the team also lost a dynamic player in Katie Johnson at No. 8. Stolba kicked back-to-back penalties to give Glendale an 18-5 lead after 50 minutes, and then wing Denali Graham’s try (converted by Stolba) at the turn of the fourth quarter signaled a Merlins’ win in the making. Reserve wing Justine Wypych scored before game’s end for the 30-5 win and berth to the final. Glendale has featured in five of the previous six national championships, while 2018 marks San Diego’s second trip. The two teams met in 2016, and the Surfers won that bout. There was plenty of excitement in the 5th place bracket as well. There were three lead changes in the Berkeley vs. Atlanta match, but the All Blues pulled through with a 19-12 win. Akilah Guzman and Chi Chi Chukwueke scored for Atlanta, as Corinne Heavner added the extras; and Cathy Cai and Bulou Mataitoga scored for Berkeley. Serena Liu drew a penalty try, and Sam Miller added a conversion. Berkeley contests 5th place against ORSU, which defeated the D.C. Furies 32-7 in the play-in round. Captain Te Awhina Ho Chee led the way on the pitch and scoreboard, dotting down three tries. That 5th place berth comes down to point differential, but Chicago North Shore is pretty happy to play for 7th considering its win against Beantown. The team went winless through regular season and trailed Beantown until after the on-field clock expired. But then a third try from prop Charli Jacoby, who is the definition of “running on a tilt,” afforded the 15-14 win. Thus, the D.C. Furies and Beantown will play each other for ninth.